Today we hauled anchor in our pretty quiet anchorage of Prickly Bay and sailed over to the bustling St George’s harbor.Among other things we were here on a mission. To find our friends back in BVI some Peanut Rum Cream. Actually it wasn’t hard to find, we just had never actively looked for it. After enjoying a heaping plate of local cuisine including a MOUNTAIN of oildown, Grenada’s carb bustin national dish at the cafeteria style Creole Shack, we went looking for the Peanut Rum stuff. Didn’t have to go far because the grocery store below the cafeteria had it! Just like that – ask and ye shall receive. So we jammed our OJ, can of peas and 3 bottles of Peanut Rum into our handy dandy, never let us down Roots knapsack and set off. That was the easy part, now back to Knot Anchored through the hustle and bustle of downtown Grenada on a Friday afternoon. 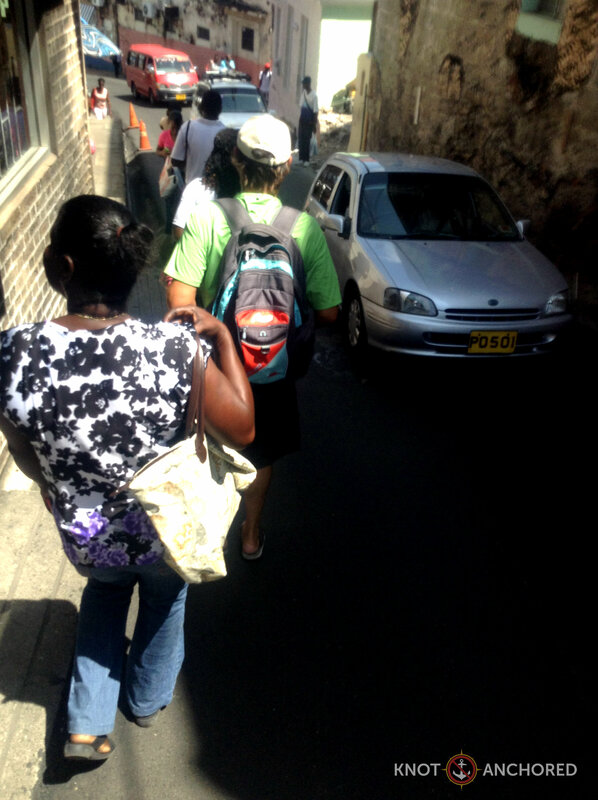 The streets of St George are very narrow and very uphill. Yes it feels like the sidewalk is heading for that fluffy cloud. It’s warm here too, 31 degrees C.
In Spain there’s running with the bulls, here everyday is an ‘adventure’ sharing the narrow roads with cars and ditches. Wet sandals are also a challenge on the up and down roads. 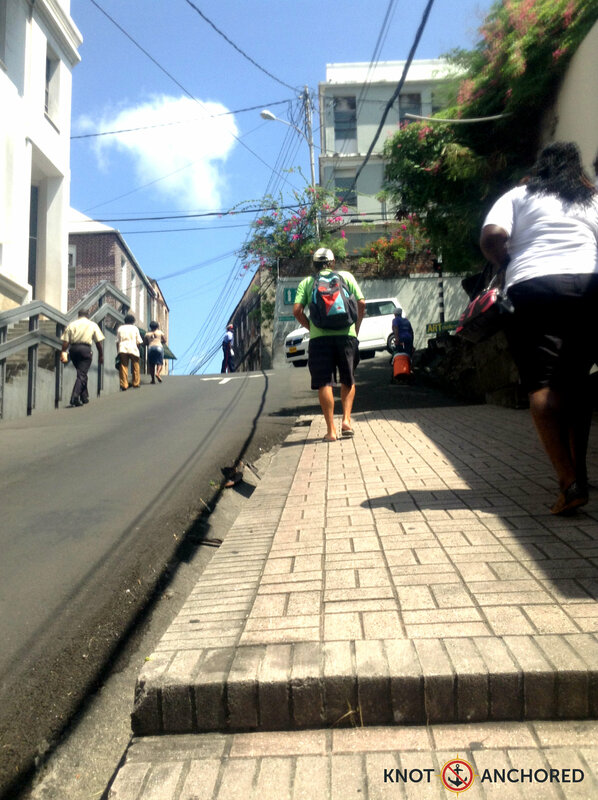 Bottles clanging, sweat pouring in the blazing Grenada sun. I need to mention how freaking friendly the Grenadians are, not just manners ‘how do you do’ friendly I mean open arms big smiled hellos with a ‘hope you are enjoying your day friendly. Never experienced such overwhelmingly happy go lucky people like this ANYWHERE in the world. I want to put em all in our knapsack and carry them around for when we’re feeling blue. This is for you Alternate Lattitude cause you work hard and you’re lovely people and that’s one of the things sailors do for one another. Pick up obscure hooch from exotic locales. Now there’s only 100 days to go before we will see you to drop it off. Next We Let the Ugly Ones Go!